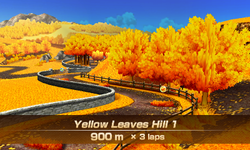 Yellow Leaves Hill 1 is the first track of the Yellow Leaves Hill area and the first track of the Star Cup in the horse racing sport of Mario Sports Superstars. As all first tracks of each respective area, it can be accessed when players go with outings with their horse in the stable mode. Yellow Leaves Hill has a distance of 900m, sharing this distance with Green Farm 1, Green Farm 3, and Yellow Leaves Hill 3. The course takes place in a deciduous forest, with a part of the course where rocks and waterfall can be seen. The course features many off-road segments, where players must jump on platforms to traverse the large off-road area one portion of the course. Players first start the course by traveling straight and potentially jumping over a hedge to obtain stars. Players then navigate through a twisty road, which has many trees as obstacles as well as a pile of leaves in the center of the course which the horse slows down if the horse travels over it. Past this area is a straight road with dash panels on the left side and stars on the right side; the left side is quicker but the right side allows players to refill their stars more efficiently. Players also have to jump over hedges to access the stars if they wish to take the right route, though the dash panel route also contains hedges. On the right area is a raised bridge that players can cross over if they wish to cut through the course. Then, players need to cross over raised wooden platforms over an area covered with off-road yellow leaves. The leftmost path contains stars and a dash panel at the end of the path, the middle paths contain less items, but has carrots and a cluster of stars, while the rightmost path contains a carrot and several stars. Players then need to steer their horse through a wildly curving course, jumping if necessary to retrieve higher items. 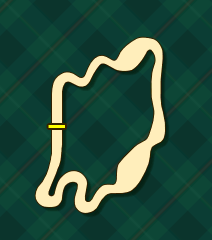 In the last straight area of the course, players can use either the dash panel or obtain a star by selecting one route, with several more stars before the end of the loop of the course. The first stretch of the course, with a hedge to jump over and stars. The twisting road, with many trees and leaf piles as obstacles. The straight portion of the course facing south, with dash panels, hedges, and stars. Traversing the large off-road area by jumping on platforms. In the wildly curving road. The last stretch of the course.